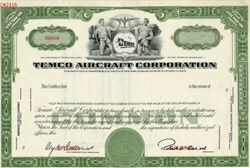 Beautifully engraved Specimen certificate from the Temco Aircraft Corporation. This historic document was printed by the American Banknote Company and has an ornate border around it with a vignette of two allegorical men holding an airplane above the company's logo. This item has the printed signature of the Company’s President, Robert McCulloch and is over 44 years old. Robert McCulloch began his career in aviation when he served as a marine engineer and became a foreman of the Aircraft Division of Beardmore Naval Construction Company, located in an area known as Clydebank, Scotland, before coming to the United States in 1927. After a minor job with a machinery company, he joined Atlantic Aircraft Corporation, which then became Fokker Aircraft, General Aviation and later North American Aviation (NAA) Company. Robert became Factory Manager in 1941, but moved to Convair as General Manager of that company’s plant in Nashville, Tennessee. In 1943, he returned to NAA and by the end of WWII, he was head of the Dallas facility. 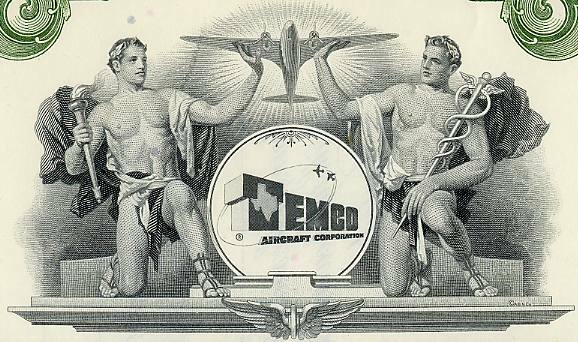 When NAA Dallas closed, McCulloch and H. L (Bert) Howard (another NAA executive) formed Texas Engineering and Manufacturing Corporation, later TEMCO Aircraft Corporation. Thus the aerospace industry remained in Dallas, for by keeping the plant open and in production, Bob McCulloch made it possible for Chance Vought to be moved into the large facility in 1948. And on the aerospace base grew much of the electronics industry, into which Bob McCulloch soon led TEMCO. In 1948, the Navy wanted Chance Vought Corporation to move from its crowded location on the East Coast into a less vulnerable and more modern plant inland - away from coastal areas which might be threatened by a warming up of the “cold war.” Dallas civic leaders (including Mr. McCulloch) cited the labor market, favorable climate, etc. But a key factor in Chance Vought’s move was the availability of the plant – ready and waiting. Two companies which were later to become major predecessor companies of Ling-TEMCO-Vought, Inc., thus were brought together in Dallas. Mr. McCulloch’s company had by that time become a major aerospace company, making sections of almost every military aircraft being produced in America, such as the Lockheed F-104 and P2V, the McDonnell F-101 and P2V, the Boeing B-47, and many others. It acquired the Luscombe Airplane Corporation, across Dallas at Garland; played a key role in modernizing and overhauling planes for the Berlin Airlift and the Korean War, and became a respected competitor for all aerospace business. Ten years after it was founded, the company had 7,000 employees. But Mr. McCulloch was far from satisfied. He was one of the first to realize the increasing dependence of aircraft and missiles upon electronics, and began diversifying into this field. By 1960, when TEMCO merged with Ling Altec Electronics, TEMCO had produced from its own designs jet trainer aircraft, sophisticated missiles, and a variety of electronic systems. When James J. Ling approached the company and proposed a combination of capabilities, Mr. McCulloch quickly saw the wisdom of combining Mr. Ling’s already established electronics enterprises with his TEMCO Electronics and Missiles Company. In June of 1961, TEMCO and Chance Vought Corporation merged to become Ling-TEMCO-Vought, Inc., with Robert McCulloch as Chairman of the Board and Chief Executive Officer. He remained as Chairman of the Board and later Chairman of the Executive Committee until his retirement in April, 1970.